We are witnessing a significant transformation driven by the semiconductor industry's need to supplant physically driven photolithography patterning methods with new chemically driven patterning methods. Still another way to carry out area-selective ALD is to let nature choose where to grow ALD films rather than artificially activate or deactivate surface regions. 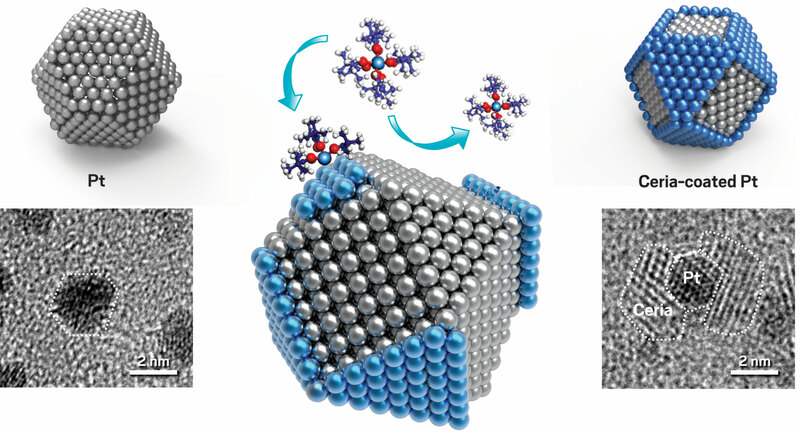 At Huazhong University of Science & Technology (HUST), Rong Chen and coworkers found that intrinsic differences in the surface energies of various nanoparticle facets, or crystal faces, can cause an ALD reagent to preferentially bind to one facet over another. That selectivity causes the product ALD film to grow on the preferred facet. That's like spray painting a set of nanosized dice and ensuring that only the even-numbered faces are coated. Surface energy differences between facets of a platinum nanoparticle (left) cause a ceria precursor molecule to bind to Pt(111) facets but not to (100) facets (middle), leaving just the (111) facets covered with ceria (middle and right, blue). Transmission electron microscopy images confirm selective deposition. The group applied its finding to a model catalytic system—ceria-coated platinum nanoparticles. Many large-scale chemical processes depend on metal nanoparticles supported on metal oxides. As these kinds of catalysts age, small particles often coalesce into larger ones, burying catalytic sites in the interiors of the larger particle and causing a drop in catalytic activity. Protective coatings sometimes mitigate the coalescence, or sintering, problem, but they can block reagent molecules from reaching catalytic sites. The HUST team prepared custom-made catalysts to study the problem. The researchers used an organocerium compound and ozone as deposition reagents and showed that the ceria film produced via ALD selectively grows on Pt(111) crystal faces and leaves the (100) faces bare. Then they evaluated the catalysts’ ability to mediate CO oxidation—a key reaction in engine-emissions cleanup. Their tests showed that Pt nanoparticles decorated with thin patches of ceria were more active than uncoated ones and exhibited improved resistance to sintering up to 700 °C (Small 2017, DOI: 10. 1002 /smll. 201700648) . ALD"s facet-dependent chemistry may also benefit microelectronics. The materials in the HUST study, a metal-oxide insulator and a metallic conductor, are used throughout electronics manufacturing. And silicon and other semiconductors are known to exhibit facet-dependent chemical and physical properties. Many of the presentations at the Raleigh workshop ended with session chairs having to cut off questions and proposing that speakers and attendees continue their lively discussions offline. And discuss they did. The meeting was filled with enthusiastic researchers talking shop in every corner of the conference center. The broad collection of ALD advances unveiled last month represents just the tip of the iceberg in this developing field of spatially controlled film growth. But it suggests a high level of interest. Copyright © 2011-2017 lamd.hust.edu.cn. All Rights Reserved.